After I made the decision to cancel our appointment with Dr. Jason from Lap of Love, Ethel and I went to the store to pick up some pee pads and a new, more decorative stand for the food bowls. It is easier for Fred to have his food raised off the ground. But I refused to pay $30 for a stand so I taped a plastic crate to a box and covered it with a plastic yellow tablecloth. The black wire stand is much nicer and worth the money. We’re starting fresh. It was the right decision, cancelling the appointment. We spent the day cleaning up, laundering dog beds and towels, and enjoying a beautiful afternoon. Fred even got a sponge bath. Later, we watched Sunday’s episode of Downton Abbey. 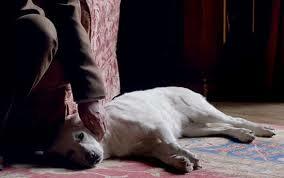 Wouldn’t you know it, Lord Grantham’s dog, Isis, is sick! I’m glad I didn’t watch it on Sunday. Most of all, I feel calmer. Fred and Ethel must feel calmer, too. It’s like a storm was heading right at us and took an unexpected turn away at the last minute. The clouds have passed and a new day is dawning; a new day for all of us.